“Conventional wisdom,” rather than latest quality data, often a factor in brand selection, says new J.D. Power study. Makers like Ford -- its new 2013 Fusion shown here -- and Hyundai have to overcome negative quality perceptions that lag reality, according to a new study. Word-of-mouth is typically a critical factor in the choice a car buyer makes, yet “conventional wisdom” about which brands have the best quality may be sorely out of date, notes a new study by J.D. Power and Associates. Nonetheless, 40% of buyers say they steered clear of one brand or another because of what they’ve heard about quality, rather than actually checking for the latest data. Meanwhile, though Detroit automakers have long abandoned their “Buy American” campaigns, the public’s interest in bringing more manufacturing jobs back to the U.S. seems to be paying off. Power’s latest annual “Avoider Study” finds that that nearly one in seven buyers has steered clear of a foreign-badged product precisely because of where it was made. The 2012 Avoider Study also found that fuel economy is now the most influential factor in choosing – or avoiding – a product, though factors like price and styling are also strongly influential. “The fact that so many new-vehicle buyers may be basing their opinions about quality and reliability on pre-conceived notions, rather than concrete information or data, demonstrates how important it is for automakers to promote the quality and reliability of their models,” said Jon Osborn, research director at J.D. Power and Associates. 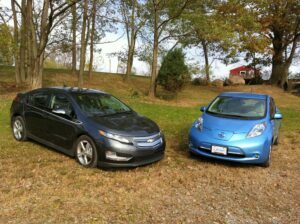 Price scared off potential Chevy Volt (l) buyers, while styling was a big deterrent for those looking at the Nissan Leaf. The study, which relied on responses from more than 24,000 buyers of 2011 vehicles, found a dramatic shift underway when it came to consumer attitudes towards a vehicle’s place of origin. In recent decades, there was a strong and growing trend favoring imports. But the pendulum appears to be reversing direction. The number of shoppers who avoided foreign-made vehicles rose to 14%, the highest figure seen since the Avoider Study was first fielded in 2003. At the same time, the number of car buyers who declined to purchase a domestic model because of its place of origin dropped to an all-time low 6%. But price and styling were still significant factors – especially when it came to the new battery-car niche. In fact, the Avoider Study discovered that price was the single biggest reason shoppers steered clear of the roughly $40,000 Chevrolet Volt plug-in hybrid (even with the $7,500 federal tax credit), while exterior styling were the single-biggest turn-offs for those who might have otherwise purchased a Nissan Leaf battery-electric vehicle or Toyota Prius hybrid. Performance was another turn-off, especially with the Prius, Power reports. 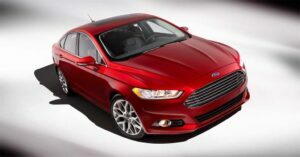 This entry was posted on Thursday, January 26th, 2012 at and is filed under Automobiles. You can follow any responses to this entry through the RSS 2.0 feed. Both comments and pings are currently closed. REALLY! REALLY! Do people really believe that their Ford Fiesta is made in America? I mean, it’s not like most of these companies even try to hide the fact that their cheaper cars are made in Mexico and Canada. If you are buying a cheaper model car, American or Japanese, there is a good chance it was made in Mexico. It seems this article is a little irresponsible for not pointing that out or at least pointing out that many Japanese and European cars are actually made in American. And yes, I realize many of their cars are also made in Mexico, but the point is that a consumer is buying a car from the Big 3 simply on the premise that is “American” when it is often not. It’s important for me to “Buy American” which means buying a car assembled in America, by Americans. Of course parts are made all over the world, that is true with any car, but my car, a Nissan Altima coupe, was assembled in my home state. That is what “buying American” means to me. A regular reader will know that we have, over the years, written extensively about the issue of where vehicles actually come from. Indeed, we published this story: http://www.thedetroitbureau.com/2012/01/70-of-japanese-cars-sold-in-u-s-now-built-in-north-american-plants/ just over three weeks ago noting the huge rise in the Japanese transplant production base. We’ve also noted, on many occasions, where so-called “domestic” models come from. So, I’ll assume that you are yourself a “thoughtful” reader who just didn’t see our earlier stories, many of which specifically question, as you put it, “what ‘buying American’ means”. Yesterday’s story was specifically focusing on the results of a new J.D. power study, not a debate of the merits of the issues it might have raised. We could have readily gone into a range of discussions on fuel economy (ie, are the fuel economy numbers makers quote and consumers are motivated by) accurate, is pricing for battery cars justified or likely to kill the technology or so on. We will, of course, continue to discuss the issue of what is an “American car” at appropriate times. I will, however, place the link to the story I listed, above, in the J.D. Power piece.